Howdy everyone, my "sunshine" is back and thanks to the dear encouragement of my dear girls and cousin, I feel much better regarding the parent issue in the previous post. Anyway hoped everyone had a great Valentine's day both singles and couples as it's not just a day about couples in love, it's also about showing your love to your family and best friends. ;) Darling and I spent the day catching up with each other since he just came back from Singapore the day before. We did some shopping in Southland and then bought food back for a home-cooked candle light dinner. 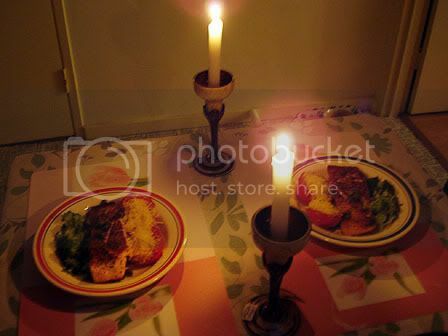 Nothing else beats a nice home-cooked dinner prepared by the charming and loving chef, and with the extra touch of the candles in their vintage candle holders which I got as a farewell gift from my previous company. On to another topic: Tennis; my favourite sport. As you might know I have been playing since end 2006 and have joined some local comps and stuff in Gippsland. When we first moved down to Melbourne, my ex coach recommended me to a coach he knew at Nottinghill tennis club in Glen Waverley. Now it all started out fine at first (with the coaching I mean). But then because I wasn't "as important" as the wannabe kid star players, the coach kept changing my time slots and then eventually passed me on to his son. Then his son had some emotional problems while moving house and stopped contacting me. I thus had to contact the father again and he fitted me in one of his "precious time slot". So all seemed fine until the weeks near Christmas when I had to skip a lesson or two as I wanted to spend more time with mum. Mr Coach then got unhappy and said I should just keep my coaching lessons on a casual basis. And I thought to myself. "What a petty and arrogant person!". And so I let the matter rest and thought I'll contact him again in the new year. And guess what? Mr Petty refuses to answer my call or sms. I couldn't be bothered anymore. Tennis may be my love, but that doesn't mean I have to beg someone for it. There are heaps other better coaches out there who are willing to teach whoever wants to excel. And so darling and I have been looking around for other tennis clubs to join since then. When he bought a new racket for himself over the weekend, we decided to try out the clay courts near our place. 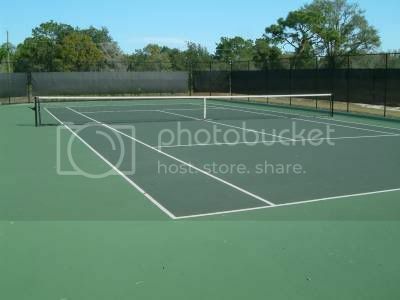 I have always only ever played on hard courts and this was my first time in the clay court. Gotta say play in a clay court is certainly much different that in a hard court. The balls are slower and the ball can suddenly change direction depending on how it hits the clay. 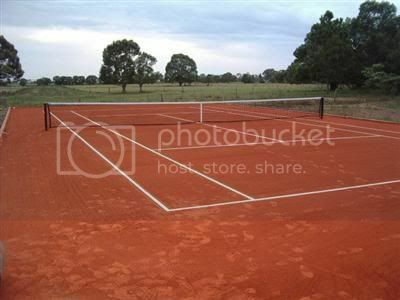 Clay Court - usually made of crushed stone or brick. Cheaper and faster to build but more expensive to maintain as they need to be rolled over to preserve flatness and spray water on it before and after play. Hard Court - Basically just hard concrete but more expensive as you have to bring in special concrete to build the courts, but cheaper to maintain. 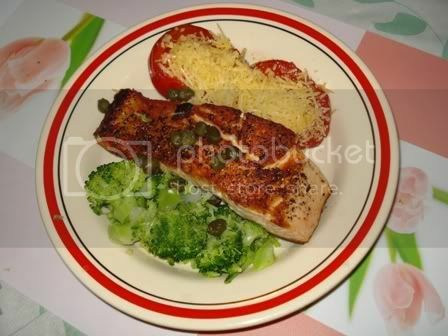 nice vday meal, so sweet of him to cook u both a meal! gd luck on ur new tennis lesson! Hello Pooh, haven't have the time to really dropby often. Anyway, you are right everyday is Valentine's Day, if you with the right person! Hope everything goes well for your Tennis lesson, I think should be fine, since he is a Singaporean. to the article there is quiet a definitely as you did in the go over like a lead balloon a fall in love with delivery of this demand www.google.com/ie?as_q=fontcreator 5.5.0.63 pro ?